BNW Builders has achieved the most coveted award in the entire roofing industry six years in a row - The GAF President's Club. 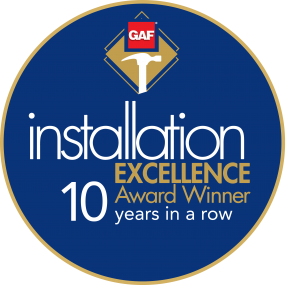 BNW Builders has earned the GAF Installation Excellence Award winner 10 years in a row! 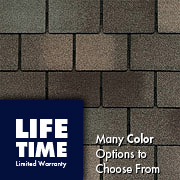 BNW Builders is your Richmond and Central VA roofing solution. Whether you are looking for roof replacement roof installation, we are the preferred roofing company of Richmond and Central Virginia. We ensure our professional roofing system and the products we use are high quality and made to last. 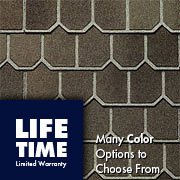 We provide a unique roofing exterior that’s maintenance and hassle free. Since our inception in 2004, BNW Builders has grown to become Richmond, Virginia and the Tri-City area's most trusted roofing company. 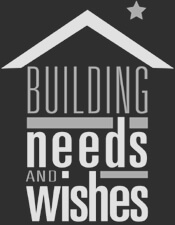 BNW knows how important it is to have highly skilled, certified master roofers on our team. BNW's roofing installers have at least ten years of experience in roof installation in Richmond, Glen Allen, Midlothian, and the surrounding counties in Virginia. We stand behind our work and truly value our relationship with our roofing customers. 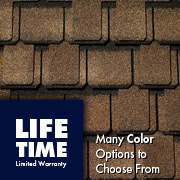 If you're looking for a new roof in Central Virginia, you've come to the right place! BNW knows how important it is to get a job done right the first time around. If you''d like to discuss roof replacement for your residential or commercial property, do not hesitate to reach out to us. We achieved the status of Factory Certified Master Elite™ Weather Stopper® Roofing Contractor from GAF - North America's largest roofing manufacturer in November of 2007. This is a big deal in the roofing industry because less than 2% of roofing contractors in the U.S. have achieved this status; an elite level set by GAF to let the consumer know their home is in good hands. There are over 19,000 cities in the U.S. and roughly 880 Master Elite™ roofers. This is a very prestigious honor. GAF is so confident in their Master Elite™ craftsmen that when we install the Weather Stopper® roof protection system you receive the Weather Stopper Golden Pledge Warranty, which is available only through Master Elite™ contractors. 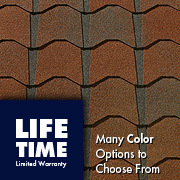 This warranty covers material defects in the entire roofing system for fifty years. In addition, they warranty our workmanship 100% for twenty-five years! In case that's not enough, with BNW Builders being a President's Club award winner you also get a GAF 40-point factory inspection of your finished roof! GAF through their award winning President's Club Master Elite™ contractor offer you the strongest, safest warranty protection anywhere - period. BNW Builders has earned the Highly coveted GAF Triple Excellence Award in 2009, 2010, 2011, 2012, 2013, 2014, 2015, 2016, and 2017 - Nine years in a row! BNW Builders has earned the GAF Installation Excellence Award in 2008, 2009, 2010, 2011, 2012, 2013, 2014, 2015, 2016, and 2017 - Ten years in a row! BNW Builders has earned the GAF Training Award in 2008, 2009, 2010, 2011, 2012, 2013, 2014, 2015, 2016, and 2017 - Ten years in a row! BNW Builders has earned the GAF Consumer Protection Award in 2009, 2010, 2011, 2012, 2013, 2014, 2015, 2016, and 2017 - Nine years in a row! 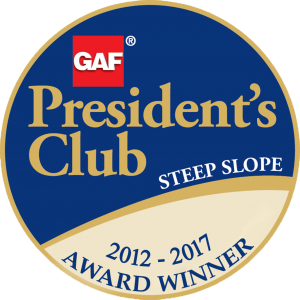 In 2012, GAF brought back the President's Club Award to further distinguish their top tier Master Elite roofers in the United States. 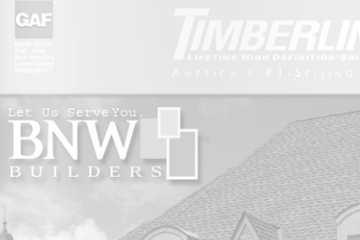 BNW Builders was 1 of only 28 GAF Master Elite roofers in the United States selected for this achievement in 2012! BNW Builders has continued its roofing excellence by continually being honored with the GAF President's Club Award in not just in 2012, but in 2013, 2014, 2015, 2016 and 2017 as well! Most people think of a new roof as just banging up some shingles, but savvy homeowners know better! Today, effective roofing relies on advanced material technology and an integrated systems approach to protect your biggest asset - your home. Founded in 1886, GAF Materials Corporation has grown to become North America's largest manufacturer of residential roofing (sold under the GAF brand) and commercial roofing (sold under the GAF brand). Here are just some of the reasons why GAF is your best and safest choice! The bottom line is: More than 1 out of every 3 residential property owners chooses GAF for their roofing project — why trust your most valuable asset to anyone else? They even carry the prestigious Good Housekeeping Seal — your assurance of exceptional quality and performance! 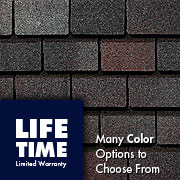 To learn more about the components that make up a superior roofing system, just click on each category below. 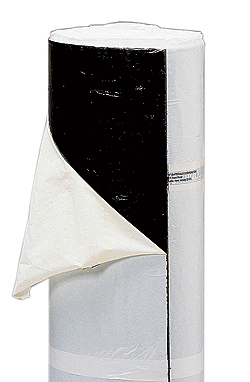 Weather Watch® leak barrier is a key part of the GAF Smart Choice® Roof System Solution. Protection against ice dams is required at eaves. Ice dams can still occur in areas where the average temperature is above 25°F (not to mention wind-driven rain). If you are in an area that requires leak barrier protection–and if there is a leak– you could be putting your insurance coverage at risk by not installing it! 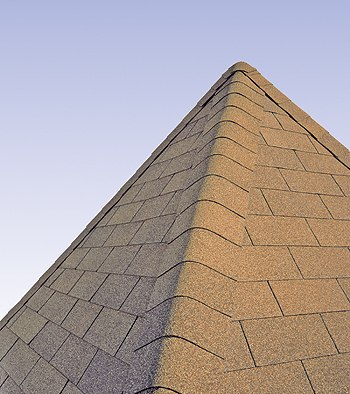 It provides a critical extra layer of protection between your shingles and your roof deck — to help prevent wind-driven rain (or water from other sources) from infiltrating under your shingles and causing damage to your roof structure or to the inside of your home. Deck-Armor™ Roof Deck Protection combines exceptional strength and superior breathability to help protect your home against roof rot and other costly damage! Exceptionally strong: At least 600% (i.e., 7 times) greater tear strength than standard #30 felt! 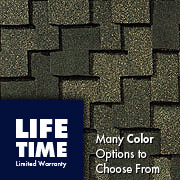 Deck-Armor™ Premium “Breathable” Roof Deck Protection resists moisture, so it lays flatter for a better-looking roof! Deck-Armor™ premium roof deck protection combines high tear resistance and nail pull-through with a special slip-resistant surface for exceptional walkability — even on steeper pitches! WARNING: “If your roof can’t breathe, the result can be decay, mold, mildew and costly structural damage!" Today’s modern homes are built weathertight — so common moisture (from cooking, bathing, cleaning, etc.) has less chance to escape. Using non-breathable roof deck protection can create a barrier that traps harmful moisture inside your roofing system. Over time, that can cause roof rot, mold, mildew and costly structural decay. 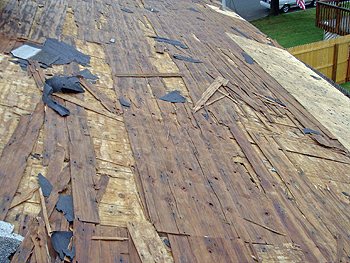 That’s why GAF does not recommend the use of non-breathable roof deck protection under its shingles! Seal-A-Ridge® distinctive ridge cap shingles are a key part of the GAF Smart Choice® Roof System Solution, and have even earned the prestigious Good Housekeeping Seal. 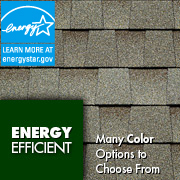 The Right Colors: Designed to complement the color of your roof’s shingles. Stays In Place: Dura Grip® self-seal adhesive seals each piece tightly and reduces the risk of shingle blow-off. 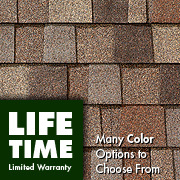 Uniform Look: Machine-cut design delivers a uniform look; much better than using cut-up strip shingles. Peace Of Mind: Covered by a ltd. wind warranty against manufacturing defects. That’s because it’s easy for a contractor to use a cut-up shingle as the “starter” course on your roof. Unfortunately, cut-up shingles may not have properly positioned adhesive to ensure adequate wind resistance. WeatherBlocker™ Eave/Rake starter strip is a key part of the GAF Smart Choice® Roof System Solution. 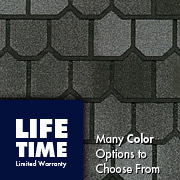 Versatile: Can be used with most English, metric, premium and oversized shingles. Great Performance: Dura Grip® adhesive locks the first course of shingles in place, reducing the risk of shingle blow-off. For Maximum Protection: Also install along rake edges to help protect shingles from wind uplift (and avoid the mess of hand-sealing the rake edges). 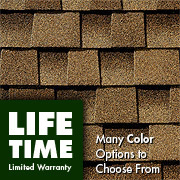 Saves You Time & Labor: No more wasted time cutting thick laminated and strip shingles allowing you to offer greater homeowner value. 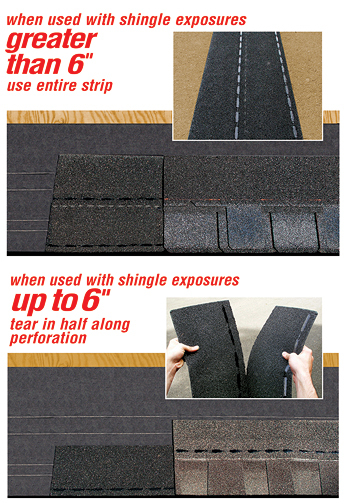 Eliminates Waste: No need to waste premium shingles for starter strips. 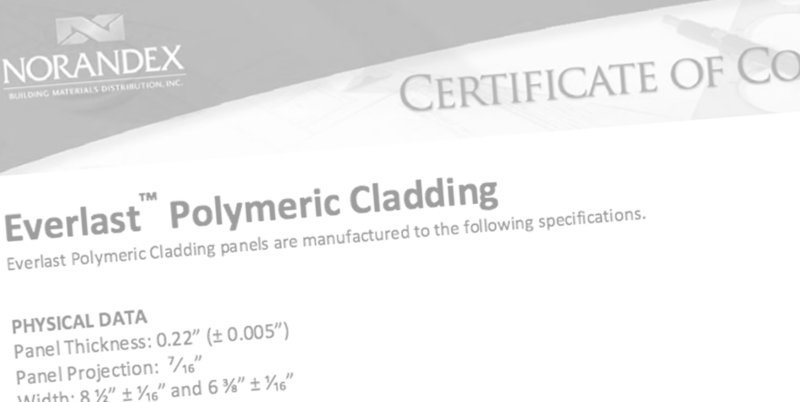 Safer: Perforated design eliminates cutting. 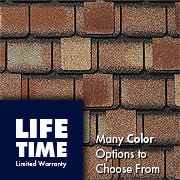 Now, you can improve your home's looks and even its resale value with Timberline® American Harvest™ Shingles from GAF. Your best investment for an ultra-dimensional wood shake look. Value and performance in a genuine wood shake look. 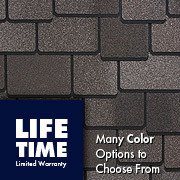 New Camelot II Shingles offer the look of the original Camelot shingles, but at an incredibly affordable price! 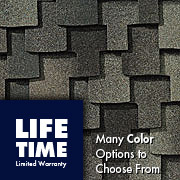 Patented, extra-large shingle with unique design create a dramatic visual impact for prestigious homes. 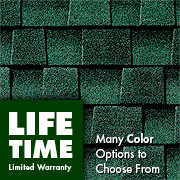 New Country Mansion II Shingles offer the look of the original Country Mansion shingles, but at an incredibly affordable price! 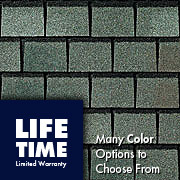 New Grand Slate II Shingles offer the look of the original Grand Slate shingles, but at an incredibly affordable price! An industry first! Thanks to our advanced shingle design, we're able to create the look of genuine European clay tile with up to 70% savings.